How Do I Get More People To Take My Quiz? October 3, 2018 by Josh Haynam	in Marketing Strategy. After all, the point of running a quiz for marketing is to generate leads and drive sales for your business, but if no one takes the quiz then neither of those things will happen. So let’s talk about this, why do people take quizzes? and how do you make yours so that the right people will take it? (potential new customers). There are really only two main reasons why people take quizzes, and they are not equally rated. The first reason is much more important than the second, but it’s like a 70/30 split, and it’s worth reading through both before you leave. Here are the reasons people take quizzes and how you can get more people to take your quiz. The reason people take quizzes and spend so much time doing them is that we want to learn about ourselves. Now it might seem like a massive jump to say that a quiz titled “Make Dinner Tonight And We’ll Tell You Which Spice Girl You Are” is telling you something meaningful about yourself, but in some small way it actually is. Also, in many cases where you create a quiz for your brand, the quiz will be much more relevant to the business and audience you work with. So let’s nerd out for a minute about why the question of “Who Am I?” is so appealing and why people spend countless hours taking internet quizzes all in the hopes of getting a little closer to answering that question. To really understand why we want to know who we are, we must first put meaning to what it means if we really know ourselves. I found this quote that describes in vivid detail what happens when we are really in touch with our true selves. Check it out. What this is saying is that when we know who we are we’re able to do more, achieve, more, be more, because we’re not wasting time figuring it out or doing the wrong things. To put it a bit more simply, if we know who we really are then we will be able to reach our goals much more effectively. 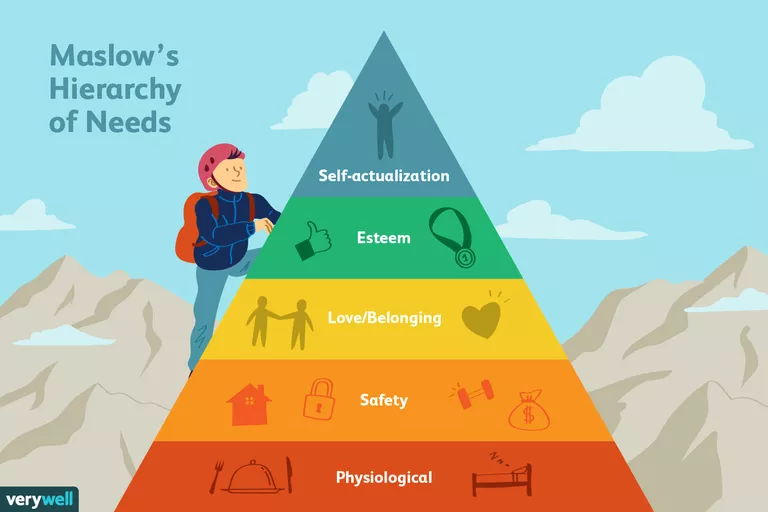 This “Knowing who we are” is also called “Self-Actualization” and it’s the thing we strive for as the ultimate goal in life according to Maslow’s hierarchy of needs. Once we’ve gotten all the basics covered like food and shelter etc. then we set off on a journey to “find ourselves” that is, according to Maslow, the ultimate goal in life. A quiz aids in that journey because it will help you find out more about yourself, even if it’s in a small and trivial way. Think about when people will be taking your quiz – on their phones while commuting, at the office during a break, laying in bed at night. They aren’t going to be looking for an in-depth psychological assessment, but if your quiz promises to tell them something about themselves it will stand out against all the other content that person might be scrolling through that has nothing to do with them individually. Putting the emphasis on the individual, turning the spotlight on the quiz taker, helping them self-actualize and self-examine, all of these things will set you apart from the internet crowd where most content is generic and consumed exactly the same by everyone who sees it. You won’t have to compete with the news or with whatever cute video is going viral at the moment because what you’ll have is a direct connection with each quiz taker who is in some small way learning more about themselves by taking your quiz. Let’s take a look at some practical examples of how this works to put something concrete to this very abstract thought. Below I’ve added screenshots of a few quizzes that help you learn about yourself in various ways. 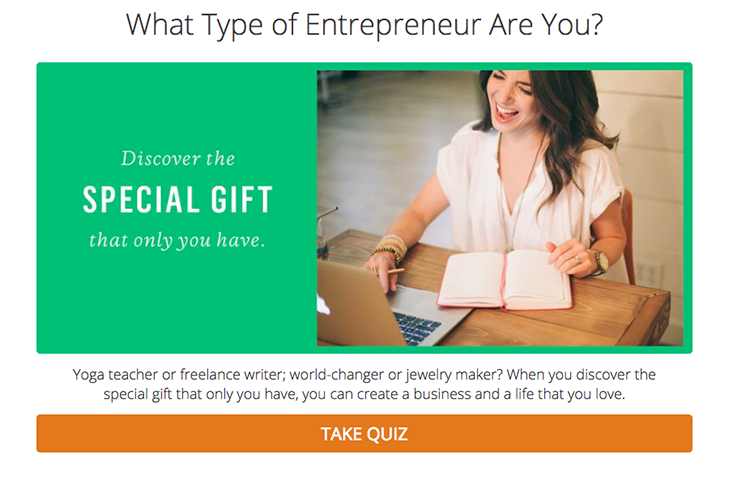 This is a quiz for entrepreneurs, created by Marie Forleo. It helps you learn about what kind of entrepreneur you are, and she even alludes to the self-actualization concept in her quiz description where it says “When you discover the special gift that only you have, you can create a business and a life that you love.” Insinuating that if you know your entrepreneur type you’ll be able to reach your goals faster, just like the quote above. 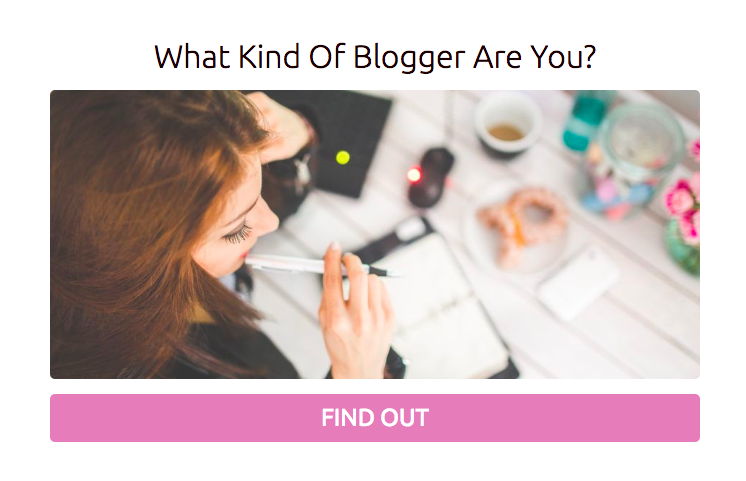 Same concept here, if you know the kind of blogger you are then you can more effectively reach your goals of becoming a full time blogger or making money from your blog, or whatever it is you are trying to do. This makes sense when you think about it intuitively because if you are more focused and spending a larger percentage of your time doing what you’re good at then you will not only have more success but also get more positive energy because it’s much more encouraging to spend your days doing something you are good at rather than something you are not good at. 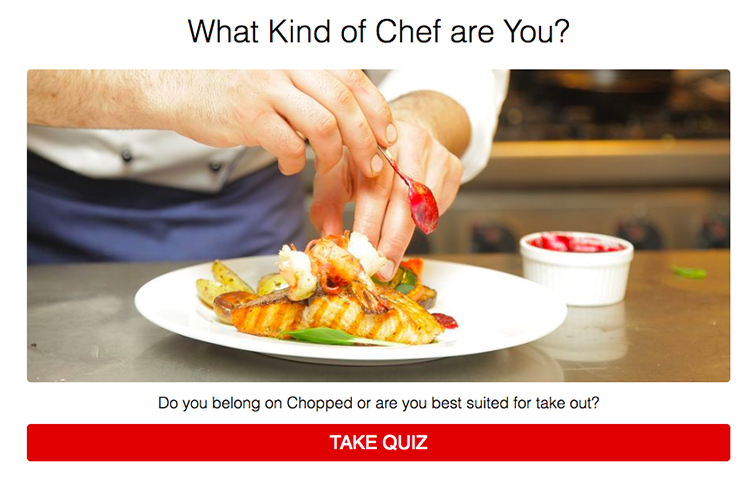 This one probably registers the most on a surface level, if you are one kind of chef and you try and make another kind of chef’s recipes, that is not going to work very well. You might not have expected to see something like this one come up on this list, and honestly I didn’t either, until I really started to think about it. See, every state has its own persona to it, when you think of Texas it doesn’t conjure up the same images as California, or New York, or South Dakota. If you help someone figure out what state they “really belong in” that is a key piece of self-actualization. Who Am I? Is the question we chase after our entire lives according to the hierarch of needs, and when you look at quizzes and particularly the ones that really go viral, you’ll notice that every single one tells you a little something about yourself, even if it seems meaningless at first. Don’t underestimate the power of self-actualization when creating your quiz and always make sure that you are providing self-learning with any quiz you create. Now, at this point the question usually becomes “How do I collect the data I need and how do I sell products if all I’m doing is showing people their personality type?” to which the answer is that you recommend your products or services in the context of how you can help each personality type achieve their goals. If you tell someone they are the “Data-Driven Blogger” and they are amazing at creating long-form content that really delivers value, then your pitch could be that you’ll help them with social media and marketing themselves, things that they’re less likely to be good at. In terms of collecting the information you need, the questions of your quiz will still serve as a way of gathering information because in order for the quiz to be accurate you’ll have to ask people about themselves, I.E. gathering data about the leads you collect. We have more on all this in our quiz best practices guide. Making choices is difficult, and anxiety inducing. 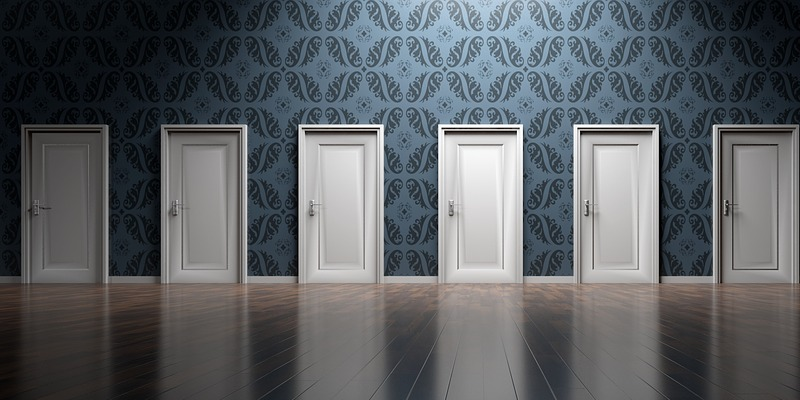 Think about every time you go to a new store and have to choose between the different options for a product, or even worse, when you’re shopping for clothes and have to decide on everything from color to cut. Some people are even opting to wear the same thing every day just so they don’t have to go through the stress of deciding what to wear each morning. Making decisions is hard, and there will always be a fear that we made the wrong choice – unless we get some help from an expert. This leads us to point #2 about how to get people to take your quiz, which is that you should use the logic within a quiz to help people decide things. Now you can’t do this for every type of business, and that’s where you’d default to helping people find out who they are, but, if you offer multiple products or multiple variations of your services then you can make a great quiz to help decide. My favorite classic example of why doing a quiz to help decide is important comes from a coffee shop. Let’s say a customer walks in interested in buying a coffee but has never had coffee before (shocking, I know, but bear with me). The kind woman behind the counter asks the customer for their preferences about taste and their habits etc. before offering up her recommendation about which coffee drink to order. Now this completely transformed what would have been an overwhelming experience to someone who had never ordered a coffee before into a friendly conversation that led to the purchase of a coffee drink that was just right for that customer. A quiz can do the exact same thing, and when well-executed will emulate that same type of conversation. Now let’s go through some examples of how this works in real life so you can go ahead and see how it would fit into your business. 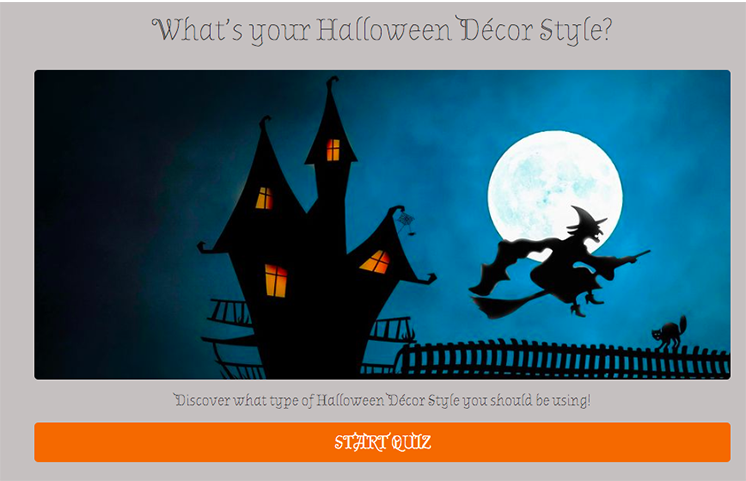 What’s Your Halloween Decor Style? If you’re decorating for Halloween (or any other holiday) it’s probably a pretty big time investment, and you don’t want it to go to waste as a failure your guests don’t appreciate. A quiz can help decide how to decorate your house so you know it will be a hit. Which Deodorant Is Best For You? I found out about this quiz from the Shopify Podcast (full episode here) In the show, the founder of Primally Pure, a natural deodorant product line, was talking about how they use a quiz to give personalized recommendations to each person who comes to their site and to help people decide which deodorant style is right for them. For a product line like this one, where there are lots of variations of the same thing to choose from, the difficult choice to make is which one you should get, so the useful quiz that people will want to take helps you find the right version for you. A different approach to helping you decide. This one gives you your skin type after you answer some preliminary questions, and then recommends products for your particular skin type. This is a genius two-step approach that I’ve seen done a lot especially with skin care where you don’t just want to jump straight into the products but rather provide a sort of “diagnosis” prior to giving out your thoughts on product picks. Using quizzes to help people make decisions removes anxiety about choosing and also ensure that you as the expert are able to guide people towards the best option based on what they tell you. Doing a quiz this way isn’t something new, it’s really a re-creation of the old-school experience you have walking into a store and getting help from the shop owner to find the right product. It’s a useful experience, and a reason to take a quiz. These are the reasons why people take quizzes all the time and if your quiz does one of these two options, and in a way that is relevant to the industry you are in, you will not only have people take your quiz, but the right people who can become your customers.